I had a successful grading for Hapkido today, where I was awarded a blue belt with two red tabs (exactly half-way between white and black belts – at least in terms of belt numbers…). It had been a long time between gradings. My last one was in 2002, back when I was a member of the Dunedin (New Zealand) club. Having moved across the world a couple of times really makes it difficult to stay with the one federation, so it has been good to reconnect with it in Brisbane. This entry was posted in Hapkido by Allan. Bookmark the permalink. Neat. I am nearing my 6th Kyu Jujutsu test, which will put me at the halfway mark. 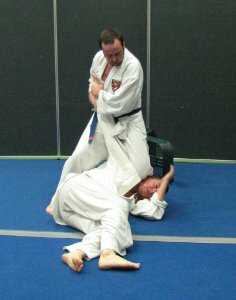 Hapkido and Jujutsu are fairly similar.